Mark Lindsay & Son Plumbing & Heating Inc relies on Goulds and Franklin Electric Well pump drives to keep your well pumps operating smoothly and efficiently. Goulds Water Technology is an industry leader offering pumps and pump controllers (drives) with advanced technology, proven reliability, and full service on a complete line of products. 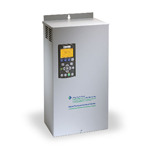 Designed to work directly with centrifugal and submersible pumps with ease of installation, Goulds’ constant and variable speed drives allow us the capability to match the right drive to your application.